Lisa Moran, MD, is a board certified general adult psychiatrist who provides emergency psychiatric services for Sonoma County. Lisa has a well-established personal meditation and yoga practice and has been a long-time member of the Spirit Rock sangha. She was in the Dedicated Practitioners IV cohort. 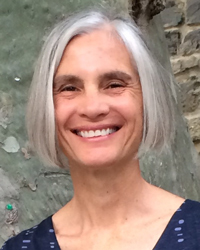 Lisa was trained to teach MBSR by the Center for Mindfulness, University of Massachusetts, and is grateful to have had Jon Kabat-Zinn, Saki Santarelli, and Bob Stahl as her primary teachers. She enjoys gardening, trying to write poetry and essays, and paddling her kayak on the Petaluma River.